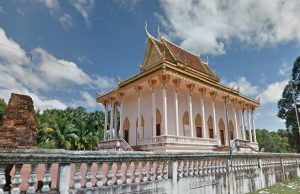 Kean Svay Krau Temple is located in Phum Thom commune, Kean Svay district, about 19 kilometers from Phnom Penh, or about '30 kilometers from Takmao. 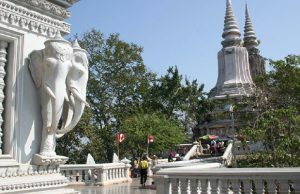 To reach Wat Kean Svay, cross the Monivong Bridge and travel east for 19 kilometers on National Road 1. The gate to Kean Svay Krau Temple is on the left. The site is about 300 meters inside the gate.The site covers 10 hectares and is lush with trees and other vegetation. Many kinds of crops and fruit are sold here. It became a tourist destination in 1979. 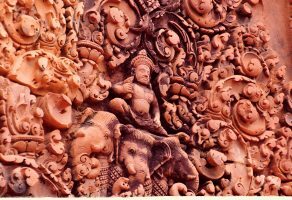 Its main attraction is Wat Kean Svay Krau. The site is popular with many tourists from Phnom Penh who come to see the floating houses and restaurants, where they can enjoy delicious foods such as grilled chicken and fish, as well as jack fruit, sapodilla, mango, banana and coconut. Fruit trees line the edge of the Ktub River, creating an inviting atmosphere for tourists to sit and relax and enjoy the beautiful scenery. The river is also a key transportation link to Ka Om village, another popular tourist site. 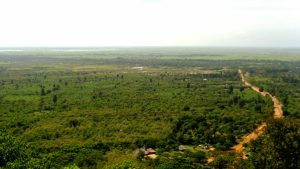 Because of the natural beauty of Kean Svay, the provincial tourism service and local authorities hope to make the site more popular with tourists. They have added parking and restroom facilities and increased security.